Hello, remember me?! 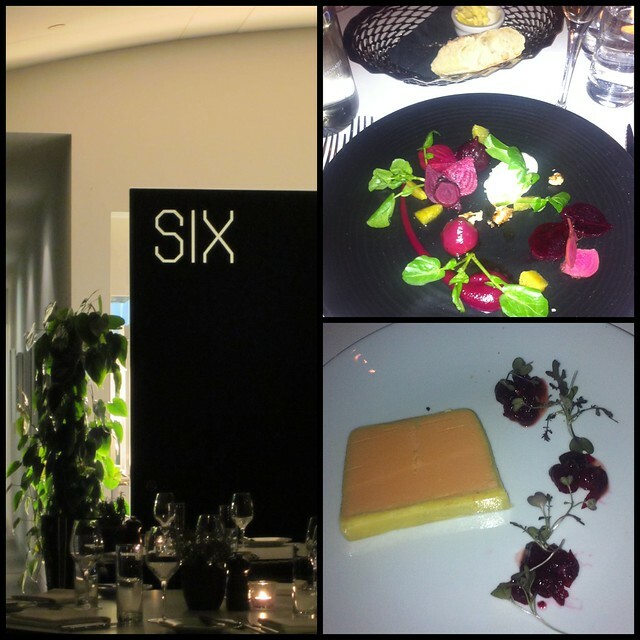 It’s a been a while so I thought it was about time we caught up.. Last week I mentioned that I’d been invited to SIX and got to enjoy amazing food and the lush views as a nice little birthday treat! I thought posting my review would be a nice place to start to get me back into blogging and launch into sharing all the Paris photos..
Having been at work all day on my birthday, I quickly changed into my Zara dress and met my mam on the quayside to walk over to SIX. When we got up to the restaurant we were greeted by Ben with two glasses of prosecco, a martini glass of ice and fresh fruit, and led into the viewing area to choose our food. Since SIX have recently launched their winter A La Carte menu, we selected our food from their range of seasonal dishes. To start with I ordered marinated heirlooms beetroot, orange, creamed goats cheese and walnut, and my mam ordered the chicken liver parfait, cranberry relish and granary toast. 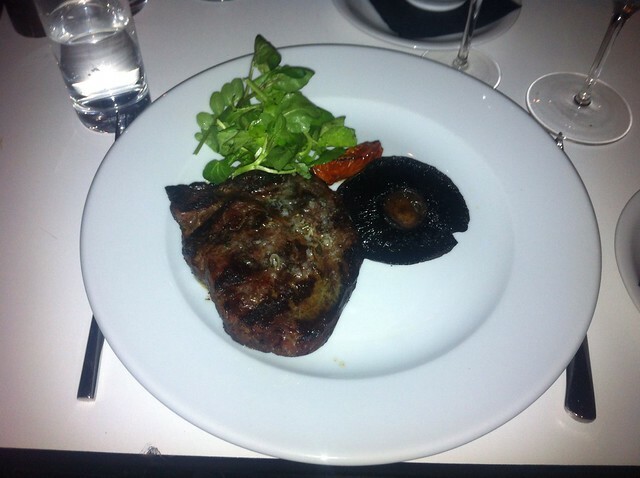 The main courses were equally indulgent. My mam chose the 10oz Wallington Hall Rib Eye steak cooked in roast garlic and rosemary butter and accompanied with handcut chips, while I decided to be a little braver and try something I hadn’t had before, so I opted the saddle of venison. Since I hadn’t eaten venison before, I wasn’t really sure what to expect but ordered it cooked the way I would usually have steak (nice and pink in the middle). And I have to say that after trying it out, I’m a huge fan. 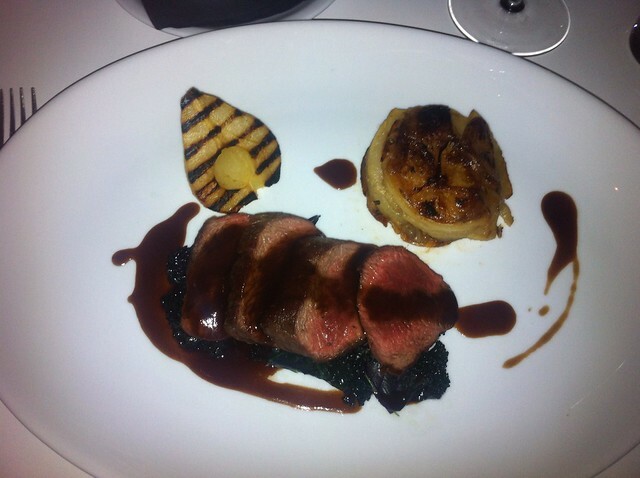 Served with charred pear, boulangere potatoes and dark chocolate, it was the perfect combination of flavours and the meat pretty much melted in my mouth. Feeling a little greedy (and because it’s nearly Christmas) we also had a side of sprouts cooked with bacon and onions to accompany our meals! Since we were both tucking into red meat, it made sense to order a wine to suit.. much to my mother’s disappointment (she’d have happily polished off a few more glasses prosecco)! However, after looking through their wine list, which is more than a little overwhelming, I had no idea what I wanted. Luckily we were assisted by the helpful staff, and Steph one of our hosts for the evening, recommended we opt for the Lunta Malbec, a deliciously rich red Argentine wine that complimented our meals perfectly. One of the main things I loved about my visit was that the staff literally could not do more for you. They were lovely and chatty, and most importantly knowledgeable. It was brilliant that everyone was more than willing to share their opinion on the menu. Having worked as a waitress when I was younger, I’m a firm believer that in order to do a good job, the staff need to know what they’re feeding you! And if they haven’t had a chance to try out the menu, then how are they supposed to describe something or give a proper recommendation? 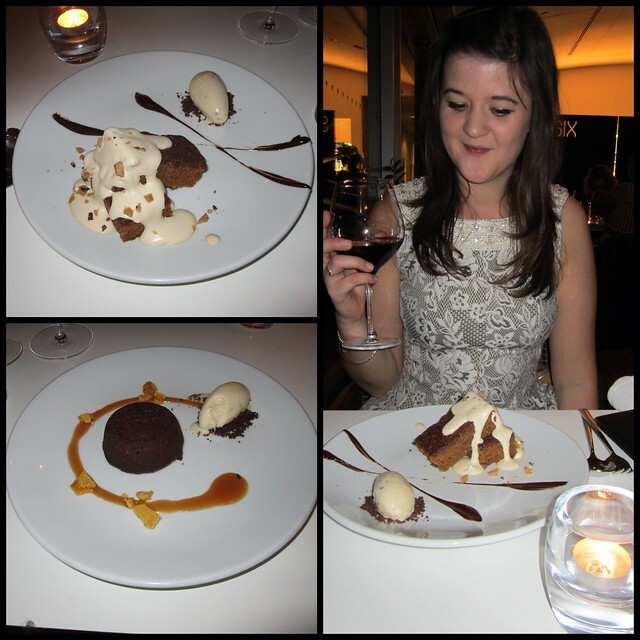 Luckily for us, the staff at SIX had all had a try of the winter menu so when it came around to choosing dessert, they made it easy for us to pick! I chose the hazelnut cake served with coffee and cocoa nib ice cream and topped with espresso cream, while my mam plumped for the decadent dark chocolate fondant with caramelised banana ice cream and honeycomb. After finally polishing off the desserts, I felt like I was ready to be pretty much rolled out of the restaurant but the staff had other ideas… Now some of you may remember that I mentioned SIX last month in my Newcastle Secrets post, and one of the guys at the bar pulled me up for claiming that Alvinos served the best cocktails. So of course for research purposes, he suggested I sample something from their list so I opted for a deliciously refreshing gin based cocktail called Breakfast at Tiffany’s. I think with the combination of the gorgeous views and pretty extensive cocktail list, I may have found a new favourite! After being spoilt rotten all evening, me and Mam are already planning our next visit, probably to indulge in their afternoon tea as a nice break from Christmas shopping. SIX get pretty busy on the evening but they also offer a great selection of daily specials or afternoon tea. 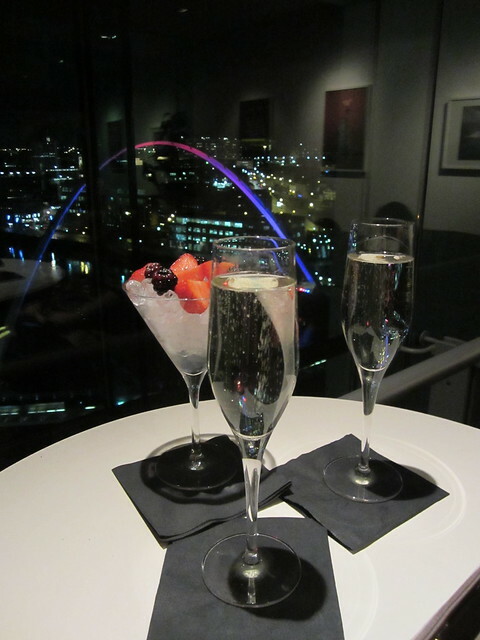 Definitely the perfect place to unwind and enjoy panoramic views of the quayside after a busy day of shopping. Previous Post Gone to Paris.. It's 8pm and I haven't had dinner. I sort of regret reading this post. Made me all famished. Haha! I used to work in McDonald's and I am so with you about the staff knowing what's on the menu. this looks great! i'm a fellow newcastle blogger just starting myself! definitely following you to get the scoop on the toon!